I created this piano shaped card. I'm not big on making shaped cards but thought I'd try my hand at this. 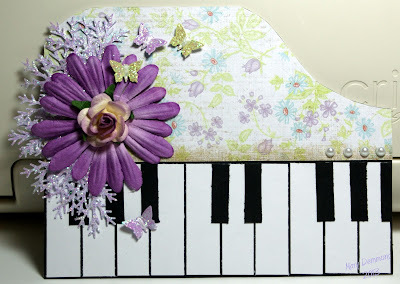 I didn't use a template just free hand cut the card base in the shape of a piano and then went to decorating it. I started with a white card base and covered the front in black. I cut white and black strips of card stock to resemble piano keys. 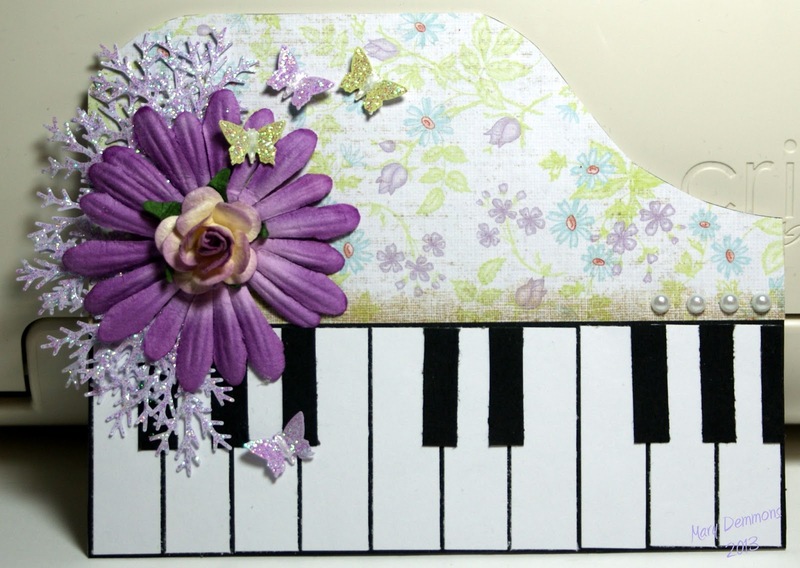 I added the floral patterned paper to the top of the card to complete the look of the piano. I added a large purple paper daisy with a purple paper rose in the center. To give a more elegant look to the flower I punched mini branches out of lavender card stock and added them to one side of the flower and added crystal stickles to each one. The butterflies are punched out of paint chip samples (lavender and spring green) that you find in the paint section of a paint supply store. I added crystal stickles to the wings and white liquid pearls to the center of each one. I finished off the card by adding 4 white pearls to the opposite side of the card just above the piano keys. Such a fantastic shaped card! Love all the detail and your design. Thanks so much for sharing with us at Creative Card Crew. Hope you have a fabulous day!